Can’t wait for da new shop to open. Props to Steph, Edwin and Koflow. Music has always been a major part of my Life. I utilize the energy from music to make me do the things I want to do. There are a few instruments that I’d like to learn to play. But I always had the problem of choosing. Until I realized, as a turntablist you could be the guitarist, the drummer, vocals and many more all in one. So I looked around at DJ courses on offer in Singapore and decided on E-TracX. The crew at E-TracX were very nice and Friendly and provided very good services. My instructor Koflow, guided me through all the basics of the turntables, mixers, and basic beat matching in the first half of the course. During the remainder, we focused on Scratching which was definitely my favourite part of the whole course. I gained a lot from the 8 one-on-one lessons. From the Basic Skills to one important tip I learned from Koflow. To loosen up. I tend to be stiff when I’m scratching which was holding me back from getting better. All the lessons were held in the air-conditioned comfort of the well equipped in store studio. I really enjoyed every single session and have no hesitation in recommending E-TracX as a place to learn how to DJ. Greeted by a friendly smile, the people in E-TracX had created a very good atmosphere and impression for me when I first started. The course itself, needless to say, was great. Koflow has been very helpful to students who have a keen interest in Turntablism. The course has increased my interest in the hobby as well as given me a confirmation that I’m up for it. Koflow teaches based on the student’s learning speed, the faster you learn, the more he would teach. I, however, was a slow-learner but he has the patience to aid his students through many ways. Aside from the course, he also gives advice to students on suitable equipment. Even after the course, you won’t be thrown at a lurch; there will be gigs and small competitions to motivate students. At the end of it all, I have really benefitted from the course and now see music with a wider perspective. Dis is ma testi for the page.. Nice place to chill, nice people around.. Great friends.. As my tutor Koflow, speaks like an old wise man everytime he opens his mouth if u do something wrong.. But he’s cool..
Music and Hip Hop has been in me since I was young. Turntablism opened my eyes to many beats, samples efxs, moves, etc.. Wat u can do wit a musical instrument u can do it on turntables.. I’mma scratch freak and I luv Hip Hop. When I was a little girl, I remember watching the older boys jammin’ on the decks. I secretly dreamed of the day I would be invited to join a session, the moment when I would be given a chance to show those boys what I could do! But, the invitation never came, instead I watched from a distance and as I grew, so too did my desire to get behind the console. So, when I saw an ad for E-TracX DJ School that read “come down and find out about our classes” that’s exactly what I did. I swallowed my fear of not being ‘cool enough’ to even set foot in a record store and headed down to see the score was. I was greeted with such warmth from the owners that I knew that this was my chance to finally fulfill my dream. The individual lessons were an added bonus; I didn’t have to worry about embarrassing myself in front of a group of strangers! Watching my soon-to-be teacher show me what turntablism was all about, in a brief showcase, cemented my decision to do the course. DJ KoFlow’s passion is so contagious, and his talent totally blows your mind! He possesses the ability to make you see the music from a whole new perspective, and encourages you to make it your own. He teaches you the skills then pushes you to create your own style. He allows you to safely learn from your mistakes and encourages you to experiment with a variety of techniques and sounds. Nothing happens overnight, and I’ve still got a lot of practicing to do, but I’m now on my way to jammin’ with the big boys. 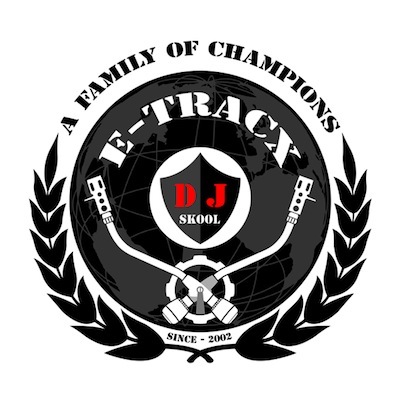 BIG UP to my E-TracX family! I started learning DJing during my army days and I went through the path of club mixing. For the past few years, I trained myself to beat-match. However, I have no knowledge of turntablism. I always felt that a complete DJ must be able to beat-match, perform vinyl manipulation and excel in one of these two skills. As a result, I decided to take up a turntablist course at E-TracX. Edwin and Steph are owners of E-TracX and they are very nice people. They make you feel at home in their shop. After a short chat, I found out that DJ KoFlow (or better known as Ninja) would be my instructor for the weeks to come. KoFlow makes turntablism look like the succulent drumstick on the dining table. His precision is fantastic and he does all the cool tricks with ease. When I tried the stuff, it was pretty hard and demoralizing. But KoFlow was very patient, he explained and made things layman, for people like me with no knowledge of turntablism, to understand. He demonstrated the tricks many times and gave me advice on how to go about doing the scratches. KoFlow also shared with me his experiences, the history of Hip Hop and the music. I think I have learned quite a few things from him and money well spent. I think DJing is not just about the technical skills and money tricks. It is also about forming new friendships, discovering your passion and almost always: THE MUSIC. E-TracX is THE place to pursue your DJ aspirations. When I wanted to learn DJ-ing, I thought that resources were hard to come by but coming to E-TracX in a way offered many opportunities. Though the courses might seem pricey for students like myself, I’d say that it is well worth it – KoFlow was a great teacher and the people at E-TracX were very friendly and approachable indeed. After completing my basic/intermediate course, visiting E-TracX still proves to be an enriching experience. I remember telling Edwin, “I don’t feel like going home once I’m at your studio”. The ambience is comfortable and everything is so relaxed and carefree. I’ll say it feels like home at E-TracX, where I can just kick back and truly enjoy myself while learning more about music. Nevertheless, I see students being groomed and challenged on their potentials; I see realness in their pursuits of music. To sum it all; this place offers a great community. Having found myself on the wrong side of the DJ booth for far too long, I decided it was time to find out what exactly was involved in spinning two records at the same time. Armed with little basic knowledge I signed up for 8 one-on-one lessons with E-TracX. My instructor Rough, guided me through all the basics of the turntables, mixers, and basic beat matching in the first couple of lessons. During the remainder we worked with a variety of genres, from drum &amp; bass, banging techno to progressive house, practicing pitching and the mixing of the different styles. All the lessons were held in the air-conditioned comfort of the well equipped in store studio. I thoroughly enjoyed my time during the course and the time spent with the friendly and attitude free crew at E-TracX. I have no hesitation in recommending E-TracX as a great place to get involved in DJ’ing and the electronic music scene. Sign up and enjoy! Having spent a year and half attempting to teach myself how to beat-mix, I finally decided it was time to seek some much needed help from a ‘real-DJ’. So after my eight week course, I can tell you that if you are looking to learn how to DJ or better your skills behind the decks from a talented DJ (thanks Andrew Tang), you really can’t go wrong with the crew at E-TracX. From the Juice magazine, I first spotted E-TracX, the ideal place to fulfill your dreams. On 31st Dec 2003, I had my first scratching lesson. As the old saying goes, “ the beginning is always difficult”. Firstly I have a language problem. Sometimes I don’t understand my teacher’s instructions. Also, I could hardly concentrate while learning. My teacher, DJ Koflow, is a good teacher. Knowing my weaknesses, he taught me patiently. When I was confused, he repeated the instructions again and again, doing his best to help me understand them. When I nearly lost my confidence, he told me not to give up, the only thing I need is determination. No matter how long I have to take to be a well skilled DJ, if I am determined, I can do whatever I want, even better. From him I have learnt not only the techniques, but also the truth of studying. Being inspired, I would use this principle on my life long studies and never give up. Thank you, my teacher KoFlow!!! Not forgetting the E-TracX crew, they are very nice and friendly people. I remembered the first time I went to Zouk. That was the first time I’ve ever been to a dance club. That night, they were so careful in looking after me all the time. Here’s to Edwin, Steph and Sandra, thank you all for giving me a great night experience and helping me all the time!!! They are good people, their hospitalities welcome you all. E-TracX makes u feel just like home! To this date I do not believe I made a wrong decision coming here. To correct a common misconception about DJing, it is not as easy as it seems. My first attempts at Beat Matching resulted in a drastic cacophony. I always ended up following the wrong beats. I am not musically inclined; I even had problems with an instrument as simple as the recorder in Primary School. But I was crazy enough to take on the turntables. Over the first 3 lessons, my improvements were minimal, yet my instructor, DJ Rough, was very patient and motivating, correcting each mistake as he spotted them, even if he had to repeat what he said over and over. He made sure I could get the fundamentals before moving on to the other essential topics, such as the various mixing techniques, scratching and beat juggling. Clearly, a very talented and creative professional. Without him, I probably would not have gotten anywhere at all. And not to forget, Edwin and Steph, the owners of E-TracX. Without their encouragement, I would not be anywhere near how far I have come. Considering my background, I had long worried that entering the DJ world would be like the country mouse migrating into the city. I did not come from the realm of “happening people”, you could actually say I was a social misfit. However, that did not stop them from bringing me to events like Beatlounge, Beat Jam, Amped and Supafly where I have observed and learned more about hip hop, turntablism and everything related to it. Through them, I have also met quite a number of other people in the DJ community. Occasionally, E-TracX would hold jamming sessions for the students to interact and share ideas, or participate in events such as the hip hop showcase in March where the students are called upon to partake regardless of their abilities. I believe it is Edwin’s and Steph’s commitment to the students that makes E-TracX more than just any ordinary DJ School. If YOU are considering becoming a DJ, well then you are looking at the right webpage. Look no further, for this is truly the place where you can be proud to say that you learned from.